The AVA was formed to promote the interests of individuals and organizations involved in the preservation and distribution of vegetarian ideas and products. Their goal is to create a widely recognized certification program to allow vegetarian-minded people to make accurate choices when seeking vegetarian options. 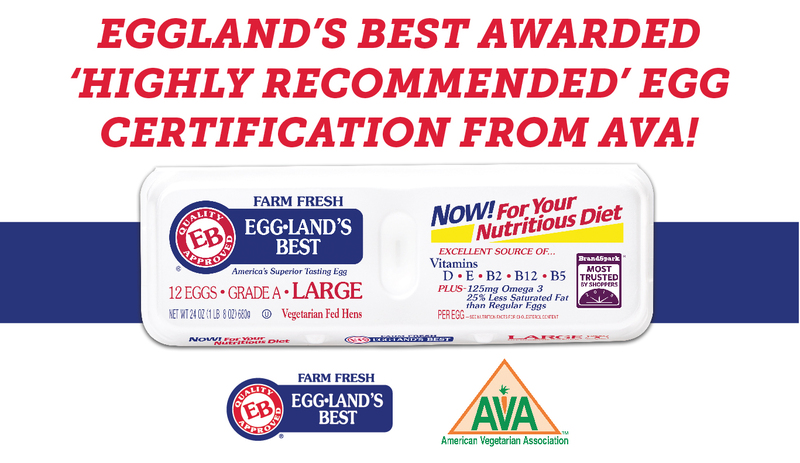 Eggland’s Best is the first and only egg brand to be certified by the American Vegetarian Association. Compared to ordinary eggs, Eggland’s Best eggs contain six times more vitamin D, 25% less saturated fat, more than double the Omega-3s, ten times more vitamin E, and more than double the vitamin B12. Plus, not only are they be included in a vegetarian diet, but EB eggs can be included in a gluten-free diet, dairy-free diet, and even a cholesterol-conscious diet.